Round cafeteria tables from NPS are very convenient when it comes to setup and cleanup. They have a torsion bar system which enables the table to be opened and closed by just one person, and can be activated manually from either side. These lunchroom tables automatically lock in the open and closed positions, and can also be locked in the partially-folded position for easy cleaning underneath. 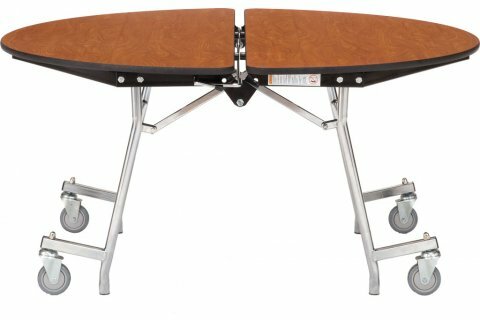 A smart design makes this sturdy cafeteria table a safe choice for your school. 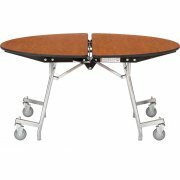 Heavy-duty casters lift off the floor when the table is in the open position. They do not extend beyond the table surface, so students won't trip over them. Tamper-free hardware and a phenolic backer ensure that these lunchroom tables will stay in great shape for the long term.